Toyota is gearing up to celebrate the 60th anniversary of its iconic Land Cruiser wagon by releasing a special-edition model. Available for a limited time, the anniversary model provides more than $5,000 of extra equipment compared with the Land Cruiser 200 Series GXL on which it is based. The added features include leather-accented interior, Bluetooth™-compatible touch-screen satellite navigation with a four-CD changer, premium steering wheel and shift lever, silver roof rails and 60th anniversary badges. The twin-turbo V8 diesel special-edition model has an effective price increase of just $76 because it also gains the Kinetic Dynamic Suspension System (KDSS), which is normally a $3,250* option. All quad-cam V8 petrol Land Cruisers have KDSS as standard. Prices for the 60th Anniversary petrol model start at $79,990*, with the increased specification representing significantly improved value. KDSS gives Land Cruiser 200 Series two previously contradictory benefits - long wheel articulation for challenging off-road driving and the high roll rigidity required for on-road roll control. Exterior paint colours feature the new "Shimmer Blue", which is unique to the special-edition model. Buyers can also choose Crystal Pearl (previously exclusive to top-of-the-range Sahara) or Graphite. The 60th anniversary signifies the development in January 1951 of the Toyota "Jeep" BJ prototype, which was larger and more powerful than the original American Jeep. Regular production began in 1953 and the name "Land Cruiser" came along a year later. 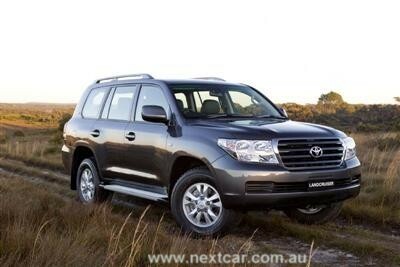 In Australia, one of the first Land Cruiser customers was construction magnate Sir Leslie Thiess, who bought several for use on the rugged construction trails of the Snowy Mountains Hydro Electric Scheme. The quality, durability and reliability of Toyota Land Cruiser in tough local conditions has led to Australia being the largest single market for the iconic off-roader - accounting for more than one in 10 of all Land Cruisers ever built. * Recommended retail prices exclude options, dealer delivery fees and the various statutory charges. Additionally, prices are subject to change without notice. ** Toyota Service Advantage details and conditions are available from your Toyota dealer.